About Us: Clifford Essex History. In 1893 Clifford Essex and Alfred D. Cammeyer formed a partnership with offices and teaching studios at 59 Piccadilly, London. At first, the banjos and zither-banjos they sold under the brand name of ‘Essex & Cammeyer’ were made for them by Temlett, Weaver, Wilmshurst and Windsor, but early in 1896 they opened their own workshops at 13 Greek Street, Soho, and were soon employing fourteen workmen to make banjos and zither-banjos for them. Following a major disagreement between the two men in 1900, the partnership was dissolved, and production of ‘Essex & Cammeyer’ instruments ceased. In 1900 Clifford Essex & Co. was born, and in 1903 Clifford Essex launched BMG, the magazine for all players of fretted instruments. Clifford Essex Banjos, Mandolins & Guitars have always been made by superior craftsmen, and to this day they are in huge demand throughout the world. When Clifford Essex dissolved his partnership with Cammeyer in 1900, he formed his own firm at 15a Grafton Street, New Bond Street, London. Instruments bearing the name Clifford Essex Co. were put on the market, and at first all the banjos were made for Clifford Essex by Spencer, Weaver, Langham [London] and Houghton [Birmingham]. In 1904 he started his own workshops at The Oval, Kensington, with Alfred Dare as foreman, and when Richard Spencer died in 1915, Clifford Essex bought his plant and stock and took his key craftsmen into his employ. Although most of the Clifford Essex instruments sold in those early days were made in the Clifford Essex workshops, some were still made by the above-mentioned outside makers. 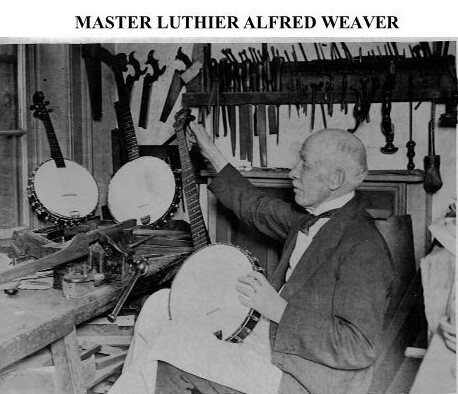 The Weaver-made banjos were made to Weaver’s own design, although they were sold with the Clifford Essex label on them. In December 1919 the firm’s title changed to Clifford Essex & Son, and by then only their cheapest model ‘The Popular’ was made outside their own workshops by Houghton of Birmingham. A. P. Sharpe, a former Managing Director of Clifford Essex, wrote several very informative books which were published by the company. In February 1936 the firm became a private limited company, and the title changed to Clifford Essex & Son Ltd. Soon after the outbreak of World War 2 the manufacture of musical instruments was greatly reduced due to a shortage of materials and the military call up of craftsmen. The firm went into liquidation in 1942, and all manufacturing ceased, but A. P. Sharpe, as a former employee of Clifford Essex, re-formed the company under the title Clifford Essex Music Co. Ltd., and continued to make quality musical instruments. After demobilisation in 1945, Marco Roccia, master luthier, who had joined the company in 1927, returned to his position with the Clifford Essex Music Co. Ltd., and was solely responsible for all repair work. In addition, he made some very beautiful instruments including ‘concert size’ classical guitars, plectrum guitars, banjos and mandolins, all of which were entirely hand made by this master craftsman. Marco remained with the company for over thirty years. 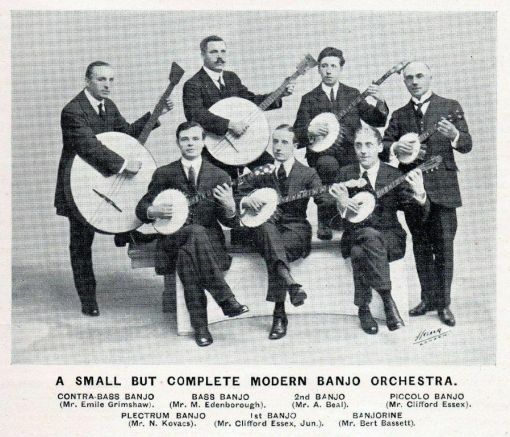 Banjos made after 1945 bear the initials C.E. in mother-of-pearl, inlaid into the peg head. Clifford Essex banjos ranged in price from (in today’s money) £3.50 to £60.00. Model names, from the cheapest, were - Popular, Clipper, Imperial, C.E. Special, Boudoir Grand Professional (the only 12” hoop model), Regal, X.X. Special (later called Concert Grand), Paravox, Paragon, New Paragon, Paragon Artist and Paragon Deluxe (the last two being gold plated). In addition the firm produced 3 grades of zither-banjo, Grade 3 (the cheapest), Grade 2 and Grade 1. Clifford Essex banjos can be dated in conjunction with the firm’s title. 1900 - 1919. CLIFFORD ESSEX & CO. 15a. Grafton Street, London. 1919 - 1936. CLIFFORD ESSEX & SON. 15a. Grafton Street, London. 1936 - 1942. CLIFFORD ESSEX & SON LTD. 90. Shaftsbury Ave, London. 1942 - 1957. CLIFFORD ESSEX MUSIC CO. LTD. 8. New Compton St, London. 1957 - 1977. 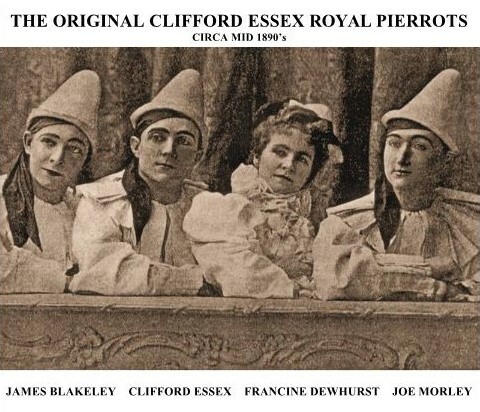 CLIFFORD ESSEX MUSIC CO. LTD. 20. Earlham Street, London. 2007 - To Date. CLIFFORD ESSEX MUSIC CO. LTD. Fakenham, Norfolk. From 1942 onwards Clifford Essex flourished under the directorship of the much respected A.P. Sharpe (AP) until his untimely death at the age of just sixty-one in January 1968. During the fifties Alan Middleton worked closely with AP as his right hand man, and during the sixties Clem Vickery took over the role. Alan Middleton left to pursue a teaching career, and in 1970 Clem Vickery left to become a professional banjoist. When AP died the company rapidly went downhill, the new management was a disaster, music rights were sold, BMG became an apology for a magazine and lost most of its readers, and less than ten years after AP's death the company ceased to exist. 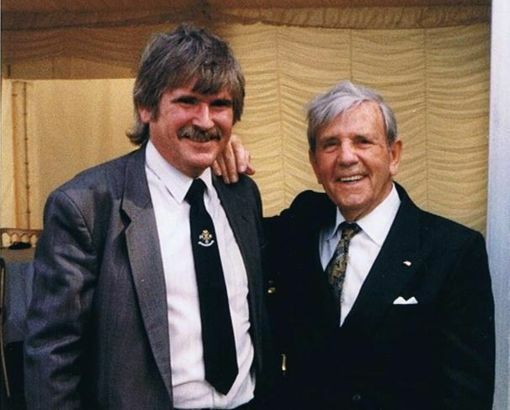 On August 6th 2007 Clem Vickery achieved his life-time ambition and re-established Clifford Essex Music Co. Ltd.; he also resurrected the company’s famous fretted instrument magazine ‘BMG’ in its original tried and tested format. Both Clem and Alan work closely together in the production of BMG. The Clifford Essex music catalogue is growing fast, and the company is once again making world class instruments. The Company which Clifford Essex began over a hundred years ago, has adapted to the modern world. CLIFFORD ESSEX PARAGON GUITAR : PRICE £15.00. The following is taken from 'Plectrum Playing For Modern Banjoists', which has been completely updated by American plectrum banjoist - Ron Hinkle and English plectrum banjoist - Clem Vickery. Born and raised in East London, there was always a banjo in the Vickery household, his father played, as did his sea-captain grandfather before him. 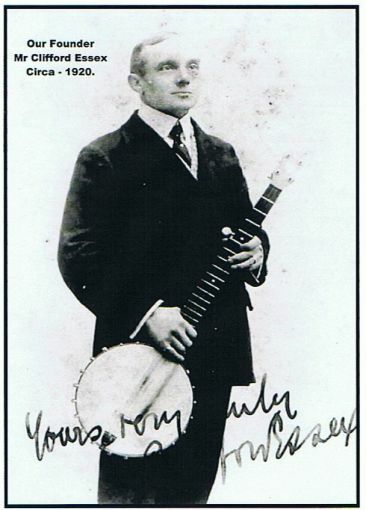 While growing up in the 1950’s young Clem could not resist the temptation to emulate his dad by constantly dabbling with the banjo, but it was his mother who noted his keen interest in the instrument, and at the age of nine she sent him for lessons with the then prominent BMG teacher, Len Stotter. 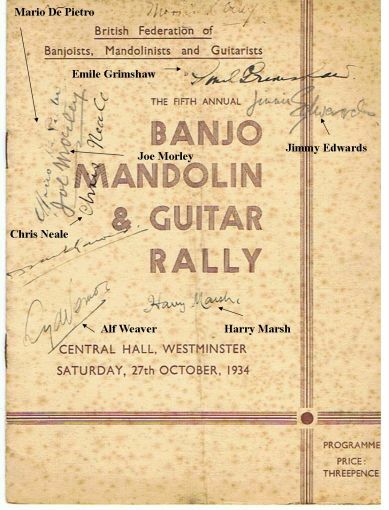 From the very first lesson Len began taking him through the original version of this book, and throughout those early years Len helped Clem perfect most of the Emile Grimshaw plectrum banjo solos. A. P. Sharpe he was given the grand job of ‘General Office Boy’. At that time many of the great players from before the war were regular customers, still very active, and Clem took every opportunity to glean as much technical information as possible from them. He would often stay at the premises late into the night practising his new-found knowledge on a company banjo. Then, in the late 1960’s, came a day which would change his life. A smartly dressed gentleman walked into the shop and expressed his desire to purchase a plectrum banjo, explaining that he could not play, but that was his ambition. 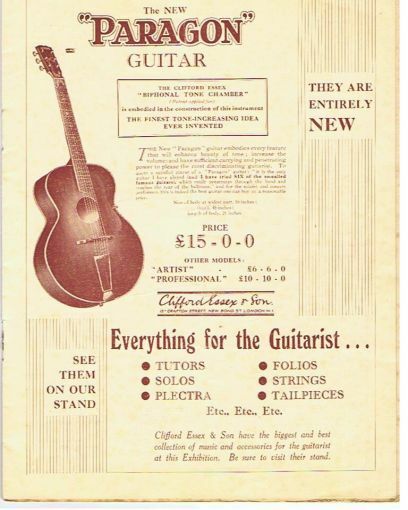 Clem demonstrated several plectrum banjos, and eventually the customer purchased one, giving a bewildered Clem his business card, and requesting that he attend his office the following day. That gentleman turned out to be a BBC television producer who introduced Clem to Ernest Maxim, the producer of the ‘George Mitchell Minstrel’ show. Clem’s mentor, A. P. Sharpe had passed away by then, so he had no hesitation in embarking on a career as a professional plectrum banjoist, — an occupation which was destined to last nearly forty years. For seven of those years he appeared as the musical speciality act in the ‘Black & White Minstrel’ show, both in the popular BBC television series, and on the West End stage. 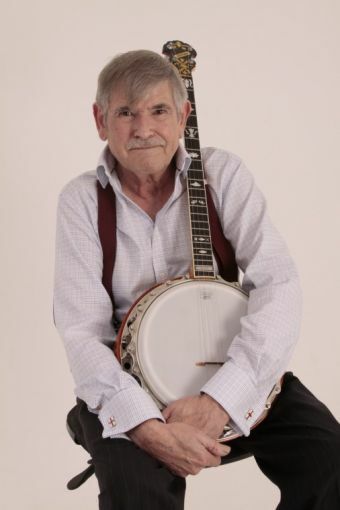 Whenever a plectrum banjo was required the BBC had no hesitation in booking Clem, so he soon became a well-known player in the BBC Television Orchestra. He also became a regular speciality act in theatres throughout the country, becoming so popular that he was given his own thirteen week television series with Yorkshire Television’s, ‘Mini Melodies’. where both entertainers were invited for tea with Prince Andrew in attendance, for their valuable work in the community.